(Q)(Ref:TO1)6/6/99 Gay Milton from Devon, England is looking for a supplier, in the UK, for the tile nippers illustrated here. They are compound geared, have replaceable blades and come in two sizes. If any one knows of a supplier or shop where these are sold please contact us at Mosaic Matters and we will forward details on to Gay. 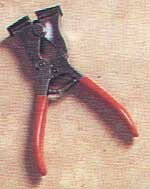 (A)The nippers that are pictured are by Starrett Tools in the U.S. (Refer to question #14). Their phone number is 1-978-249-3551. They can probably tell you a distributor on the east coast to save on S&H to England. If not, there is distributor in Seattle called the Bailey E F Company at 1-206-762-4840 and (if possible, ask for Kevin) that will sell them to you. The prices and product numbers below are for Bailey EF Company. (A) September 2011 - Pamela Phillips has found that Starrett is now a far-reaching company and has a factory in Jedburgh in the Scottish borders. Furthermore they have a website (and online store) at www.starrett.co.uk. To find the item just put nipper into the search field and it takes you straight there. It is called an adjustable jaw nipper and is sold primarily as a wire cutter that can also be used to cut tile, and it even mentions mosaic as a possible use. The price is £147.90 (£123.25 plus 20%VAT for anyone who can order through a business) with free shipping. You can pay by credit card or PayPal. This website seems to cover the whole European area so may be interesting for the colleagues from the Netherlands as well. The nipper arrived in a few days.